What Is Event Blogging - You must know all about blogging but in your mind, there will be a question of "what is event blogging?" 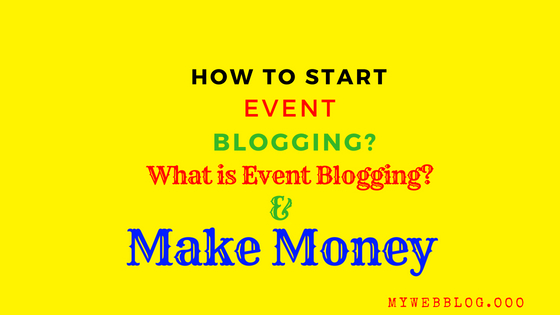 So today in this article will tell you about event blogging and "how to start event blogging?" I will also tell about it. I always ask someone whether there is a shortcut method to earn money in blogging or if not everyone is saying that if you are blogging then never use the shortcut method because there is no shortcut in blogging and if you If you take any method yourself, then you will not suffer any harm. But this proved wrong at the time when I researched about event blogging. Wow, really, this can be a good shortcut to earn money in blogging. The incoming income comes only in 5 days after winning one month's income. So before starting the post, it is important to tell you what this event blogging is like. Many people may have read about it, but still it is necessary to tell you what Event Blogging is and how it is done. Event means that you must know very well about the event and the blog, then event blogging means that by targeting any incident and writing an article on that topic, Event Blogging is called. These phenomena can happen in any way and if you live in India then there is no need to think again about which event you are going to create a blog. India is a country of festivals and there is no shortage of festival here, there is no festival or any other day, and this is a great opportunity for bloggers to celebrate a special day. The Event Blog does not have to be long because your blog is completely deserted and desolated after any event has expired, hence, bloggers also already create this blog by targeting this day and rains from these blogs. You can choose only one topic in the Event Blog, apart from that, if you do anything, then there is no point. You can choose any upcoming festival on the internet that is going to be 3-4 months later, like Independence Day, Diwali, New Year, Holi, Christmas and many Indian festivals. How to create an Event Blog that can give you a good income? There is no special expertise to do every work, which keeps good knowledge in that subject. If you ask me where you have learned about blogging from and from whom I learned, in today's time I would like to take the name of Himanshu Agrawal Ji first in the event blogging. In addition to this, if you talk about, you do not need to have any special knowledge to create any event blog. If you have basic knowledge about blogging then you can also try and make your event blog successful. I am giving some tips to those who hope that your very work is going to come. So let's know about all the information about Event Blog. 1. First of all, select your topic/event for Event Blogging? Your subject or event is your everything and you have to first select your event about which you can write very well or know very well. Your topic will be your success, so before you choose your event or topic, get a great deal of information about when your event is going to start or when it will be searched the most. Whether or not your work is finished even after the end of the event, or does it mean that it can be taken in the future. There are many such points that you should cover first and only after you become clear, you start your work. If you do not know about it then you can get help from Google, our best friend. You will find the answer to your every question. If you are not able to select your topic or you do not know which event will happen then you should ask Google as it knows the best. You can search for something like this on Google. You will get the full list. Once everything is clear, now let's say that you have selected your subject. Now you have to first create a list of all the blogs related to that topic, to see what type of article is on those blogs. You have to know about the competition on the blog you are going to create because you have to make every work unique, so if you have to check everything. Then finally you go to the keyword planner and check the search volume about the topic you have chosen for yourself, and if you are creating a related blog related to a festival, they also see in the keyword planner tool what time on that topic The highest search is done. Remember this is the most important thing. 2. Take Event Related Domain and Hosting? If you are a blogger yourself then you know very well about the importance of the domain, so you do not need to tell much more. Just want you to take the related domain from your topic otherwise! With your domain related to your topic, you will also benefit in traffic and will be easy to run. Suppose that you are making a blog on Diwali, then you should take the same domain as the Diwali word used. Before you take the domain, you can get information about the latest offers from your friends on your social media, which will get you a discount. I think Godaddy is the best place to take the domain and the cheaper domain will not get anywhere else. In India, if you are creating related blogs with festivals, then it is very difficult to find a domain of your choice because almost all the domains will be booked beforehand so you can use some number in it like you are creating a blog on Diwali. You can take a domain like happdeewali2018 or you can try anything else you want. Your blog's age will not be much, but if your blog is ranked, then all your dreams will be completed the number of days that will be done, and in the meanwhile, if there is a problem in your hosting and your site gets down, then understand that there will be a lot of loss. So if you are thinking of earning money by investing money, then do not skimp on the hosting issue and buy a good plan for yourself and for this, you can take the hostage from HostGator, BlueHost, Digital Ocean, Site Ground. Now after making the right choice of domain and hosting, you should now set up your blog. You should also know about when to do this work because it depends only on your topic or event, but in India, it is good if you start work only about 4 months before your event. Your blog setup should also be awesome and look professional and attractive too. If you are on WordPress then choose a theme that is very fast to load. For this, you can choose a theme for yourself by searching the Clean and Mobile Friendly Theme on google. After this, you must use Category and Tags in the blog, because any event blog contains more tags than category, so you should not miss any tag related to the event and mention it to everyone. After this, now you can select your target and start the work. Firstly, you should search the trend and make a list of all the keywords. First of all, you can use Google Trend or you can also use Twitter Tag. You should make a long list of all popular keywords and post them accordingly. If possible, you can create more Facebook and Twitter accounts, which will help you share your posts and become viral. After publishing every post, please share it on all your social media. After everything is set up, now the game starts to earn money. So now you start typing and writing as much as possible and writing. You can select your target in advance, how many posts do you have to publish in one day, the more effort you make, the more money you earn. While writing a post, keep the focus of SEO carefully and try to make every post a good quality poster so that you can use free or paid tools as well. > Any post written by you must be of 1500-2000 words and if you have knowledge about that topic then writing so many words is not a difficult task. > Apart from this, you should use more and more internal links in your post, which will greatly benefit you and your traffic will also increase. > At the end of every post, tell the reader that you must share this post with your friends. > Always use the Long tail keyword in the post. short keyword automatically will become rank. > If you are talking about offer or coupon in the post, then add your affiliate link. > Use images in the post wherever you need it. > Shorten paragraph so that more internal links can be found. > If you have a video related to your event blog in your post, then it is possible to make a link, upload your own video and upload it here. > Make at least 60 posts in blogging for 4 months. As I have been saying repeatedly that you have to make a lot of money in less time, whenever you publish your first post, then monetize it at the same time. If you already have Adsense account then you can validate your site and apply its ads and if not, then you can apply after posting 10. If your content is unique then I do not think it will take time to get approved. The other way is that you can buy Adsense from someone and apply ads, but I will never recommend this method. Apart from this, until your Adsense is approved, you can place any other company's ads or if your blog is related to festivals, then you can use a lot of Amazon affiliate or Flipkart affiliate even if you use it. You can earn good money. When festivals happen in the season, you also know that many special offers come, you should also continue searching the best offer for yourself and promote it on your blog so that you can generate good income. For this, you can also get information about coupon and discount websites like visiting Grabon and latest coupon information. If you have a product of yourself, then you can also promote it, because it is the best time to promote your product. Now, if you have to rank your blog then you also have to work on creating a backlink for your site so that you can get good traffic. There is a lot of ways to create a link. Now here we will be working on our list which I have mentioned above. As I mentioned that you have made a list of related blogs, now get rid of that list and start link building work. What are the ways of link Build now? > Event Blogging is the most popular of those who use the most - Guest Post. We have a list of our Event-related blogs, from which any of the DA and PA is good, please post on the site and tell us that we also have a blog on which we are giving similar information and you can Visually visit If your content is good, then once it will visit, you will visit again and again. > If possible, you can show only one post on the homepage and in that post you mention all your keyword and post links and most of the backlink also make this page. > If you have an old event blog then import it so that you will have to work a lot less. > If you have a blog that already has good traffic then you can add a link to your Event blog in its footer or tell it through the post though I have never used this method anymore because it is not recommended too But many people use it. You too can do it. > Make a target country choice in Google Search Console. > Social media is the most powerful in Event Blogging so you can use it to increase traffic. > If you have an old domain, then redirect it to your new blog, which is a good way to increase traffic. > Make a comment on your Blog related blog and add a link to your post in the comment. > In Event Blogging, we choose a theme that has the footer you can show and you show your content in the footer. I hope you understand this article to What Is Event Blogging | How To Start Event Blogging?